Ethiopian Airlines (Amharic: የኢትዮጵያ አየር መንገድ (Yäitəyop̣əya äyärə mänəgädə); የኢትዮጵያ (Yäitəyop̣əya)? in short), formerly Ethiopian Air Lines (EAL) and often referred to as simply Ethiopian, is Ethiopia's flag carrier and is wholly owned by the country's government. EAL was founded on 21 December 1945 and commenced operations on 8 April 1946, expanding to international flights in 1951. The firm became a share company in 1965, and changed its name from Ethiopian Air Lines to Ethiopian Airlines. The airline has been a member of the International Air Transport Association since 1959, and of the African Airlines Association (AFRAA) since 1968. Ethiopian is a Star Alliance member, having joined in December 2011 (2011-12). Its hub and headquarters are at Bole International Airport in Addis Ababa, from where it serves a network of 113 passenger destinations —19 of them domestic— and 35 freighter destinations. Ethiopian flies to more destinations in Africa than any other carrier. It is one of the fastest-growing companies in the industry, and is the largest on the African continent. It is also one of the few profitable airlines in the Sub-Saharan region. The airline's cargo division was awarded The African Cargo Airline of the Year in early 2011. Recently, Ethiopian won the Best Regional Airline of the Year award at the 41st Annual Airline Industry Achievement Awards by Air Transport World (ATW), held in Washington, D.C. on 25 February 2015. After the liberation of Ethiopia, Emperor Haile Selassie I asked the United States, the United Kingdom, and France to help him to establish an airline as part of his modernisation effort. According to the BBC News it is possible that the Emperor intended the creation of a quality national airline to help dispel impressions of Ethiopian poverty. In 1945, the Ethiopian government began negotiations with both Transcontinental Air Transport and Western Air Express (later merged into TWA). On 8 September 1945, TWA signed an agreement with the American historian and foreign affairs advisor to Ethiopia John H. Spencer to establish a commercial aviation company in Ethiopia. The carrier, originally called Ethiopian Air Lines (EAL), was founded on 21 December 1945, with an initial investment of ETB 2,5 million, divided in 25,000 shares that were entirely held by the government. The company was financed by the Ethiopian government but managed by TWA. At the beginning, it relied upon American pilots, technicians, administrators and accountants; even its General Managers were from TWA. Minister of Works and Communications Fitawrari Tafasse Habte Mikael became EAL's first president and chairman, whereas H. H. Holloway —who was American— was appointed by TWA as general manager. The board held the first meeting on 26 December 1945 (1945-12-26), with a key point of the agenda being the deposit of E£75,000 in a bank in Cairo for the acquisition of aircraft and spare parts. Shortly afterwards, the airline negotiated for landing rights with Aden, Egypt, French Somaliland, Saudi Arabia and Sudan, and five Douglas C-47s were bought; these aircraft were flown to Addis Ababa in February 1946 (1946-02). The new airline's maiden flight to Nairobi carried a shipment of East African currency equivalent to US$3.7 million in February 1946 (1946-02), but the first revenue scheduled service was on 8 April 1946 (1946-04-08); it travelled the Addis Ababa–Asmara–Cairo route using one of five Douglas C-47 Skytrains acquired from the US Government. This route later operated on a weekly basis. The Skytrains were initially intended for military use, although Ethiopian operated them in a mixed passenger-cargo configuration. Soon afterwards, the carrier launched services to Aden and Djibouti, as well as a domestic flight to Jimma. The main five routes in the early years were Addis Ababa–Asmara, Addis Ababa–Djibouti–Aden, Addis Ababa–Khartoum, Addis Ababa–Cairo (routed via Jeddah or Khartoum) and Asmara–Khartoum. Henry Bruce Obermiller replaced Holloway as a general manager in June 1946 (1946-06). In July the same year, four more Skytrains were joined the fleet. New scheduled services to Sheikh Othman and Nairobi were launched in July 1946 (1946-07) and June 1947 (1947-06), respectively. In 1947, Waldon Gene Golien became the general manager, and the company started operating charter flights to Jeddah during the Hajj season. That year in February, three more Douglas C-47s were acquired to operate new international routes. A service to Mukalla was inaugurated in June 1947 (1947-06). In September, Port Sudan was added to the route network (it was previously a technical stop en route to Cairo), Lydda was incorporated as a scheduled destination in October and charter flights to Bombay were launched in November. Services to Lydda and Mukalla were discontinued in February and April 1948 (1948-04), respectively. In September, the route to Bombay became a scheduled route, with EAL flying as far as Aden, and BOAC operating the Aden–Bombay sector. The route also included stops at Mesirah Island in Oman and Karachi. For a brief period until April 1948 (1948-04), Mesirah Island was used as a refuelling stop; since then, services to French Somaliland and Aden started on a twice-weekly basis. EAL was allowed to fly to Aden using Sheik 'Othman Airport, located 16 kilometres (9.9 mi) away from the city, whereas BOAC used the Khormaksar Airport facilities, just 3 miles (4.8 km) away from the city. Aden was under British rule at the time as was Sudan, and the British Empire denied EAL landing rights at Khartoum, forcing the airline to move the refuelling stop on the Aden route to Port Sudan. The carrier recorded a £40,000 profit for 1949. Services to Bombay were withdrawn in July 1950 (1950-07). Also this year, a US$1,000,000 (equivalent to $9,852,006 in 2015) loan granted from the Ex-Im Bank enabled the carrier to incorporate Convair CV-240s, aimed at operating international routes. Two CV-240s, named ″Eagle of Ethiopia″ and ″Haile Selassie I″, entered the fleet in December 1950 (1950-12); starting January 1951 (1951-01), these aircraft were subsequently deployed on the Addis Ababa–Cairo, Addis Ababa–Nairobi, and Addis Ababa–Jeddah–Dhahran–Karachi routes, with Dhahran and Sharjah being incorporated to the route network on 20 February. In April 1952 (1952-04), the airline was appointed general sales agent for TWA in Kenya, Tanganyka, Uganda and Zanzibar, and by May the same year the fleet consisted of two Convair-Liner 240s and nine Douglas DC-3s or their subtypes, operating a route network that was 7,000 miles (11,000 km) long. Services to India and Sharjah were discontinued in 1953. On 14 Jul, a new agreement with TWA that succeeded the original one was signed. Unlike other companies, the airline's preamble stated that it was ″the ultimate aim that EAL shall eventually be operated entirely by Ethiopian personnel″. A new service to Athens via Khartoum and Wadi Halfa was launched on 3 April 1954 (1954-04-03). A third Convair CV-240 (″The Spiritual Power″) was purchased from Sabena in 1955 for US$560,000 (equivalent to $4,955,130 in 2015). These aircraft were equipped with rocket-assisted take-off devices. This was a common practice for a small number of airlines in the World that EAL had abandoned by April 1956 (1956-04). Also in 1955, Ethiopian inaugurated a self-owned maintenance facility. That year, Vic Harrell succeeded Swede Golien as general manager of the company. The carrier was in need of newer and larger aircraft, and three different aircraft types —two from the Lockheed Corporation, the Constellation and the Electra, and the Douglas DC-6— were considered for the fleet renewal programme. Two Douglas DC-6Bs were eventually ordered in 1956 for US$4 million, including spares; an option for a third machine was also taken. Another loan obtained from the Ex-Im Bank, a GB£8,5 million one dating back to 1955, was partly used to finance the two purchased aircraft. Benghazi was briefly served between 7 November 1956 (1956-11-07) and 15 January 1957 (1957-01-15). During 1957, a third DC-6B was purchased. Likewise, that year the airline had been asked to take a Lockheed L-749 that had been given as a gift to the Emperor, who declined it. Ethiopian paid US$1.6 million for this airframe, and it was incorporated into the fleet on 4 June; the aircraft was destroyed by fire on 10 Jul in an accident in Sudan. Two Yemeni cities, Hodeida and Taiz were first served on 1 September 1957 (1957-09-01). On 23 May 1958 (1958-05-23), flights to Wadi Halfa were terminated. The incorporation of three Douglas DC-6Bs took place between May and July, and EAL started a new link between Addis Ababa and Athens, via Cairo, using these recently delivered aircraft. On 21 Jun, the route was extended both to the north and to the south so that Frankfurt and Nairobi became linked by the same corridor, operated with DC-6Bs. By this time, the Convairs were redeployed to serve domestic and regional routes. Given that radio operators were no longer required as part of flight crews, they were assigned other tasks with the airline. Swissair handled the pilot training for the DC-6B aircraft at Zurich. The suspension of fifth freedom rights between Djibouti and Aden prompted the discontinuance of the route that linked them. EAL joined the International Air Transport Association (IATA) on 1 January 1959 (1959-01-01). During the year, two Boeing 720Bs were ordered and scheduled for delivery in December 1961 (1961-12), two more DC-6Bs entered the fleet, services to Nairobi were suspended once more and the airline's list of domestic destinations saw the incorporation of Bulchi, Dodollo, Lalibela and Masawa. Port Sudan was removed from the list of destinations on 1 March 1960 (1960-03-01). The airline had its first fatal accident on 15 July when a DC-3 crashed en route from Bulchi to Jimma, killing the pilot. A Convair 240 was sold to Allied Stores of Israel on 18 July. On 12 August, an order with Boeing for two Boeing 720B aircraft was placed. EAL's general manager had already brought the idea of acquiring two jet aircraft for long-haul operations up already in February, suggesting the Boeing 720B. The Sud SE-210 Caravelle, the de Havilland D.H.106 Comet 4 and the Boeing 720B were all taken into account. 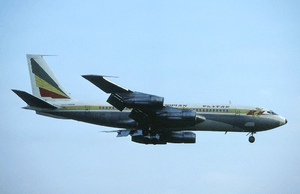 Hot and high condition of some EAL operations made the Caravelle inappropriate, whereas the Comet was considered obsolete. The first East–West link made by an African airline started on 8 November, when the Addis Ababa–Accra–Lagos–Monrovia route was launched using DC-6B equipment. The second fatal accident took place on 5 September 1961 when another DC-3 crashed shortly after takeoff from Sendafar; a flight attendant and four passengers lost their lives in the accident. The event urged the Civil Aviation Department to investigate the accidents. It was found that the lack of infrastructure at many airfields, marginal even for DC-3 operations, was a major contribution. Landing sites at Gore, Mizan Teferi and Tippi were included in the list of airfields that would require closure. On 13 January 1962, the crew and four passengers lost their lives in another accident involving a DC-3 —registration ET-T-1, EAL's first aircraft of the type—, this time the crash taking place at Tippi while the aircraft was taking off. The event prompted the government to decide the closure of the airfields at both Mizan Teferi and Tippi. In March 1962 (1962-03), two more DC-3s were acquired, and registered ET-ABE and ET-ABF. During the year, the ″ET-T-″ registration would change to simply ″ET-″. Jack B. Asire became general manager in April 1962 (1962-04). It was also decided to build a new airport to replace the Lideta Airfield, unable to accommodate the Boeing 720 jetliner the company intended to acquire. This was the birth of Bole International Airport, where the company set its headquarters. In December 1962 (1962-12), the arrival of two Boeing 720s ordered directly from Boeing marked the carrier's entrance into the jet age. These two aircraft were registered ET-AAG and ET-AAH and were named ″Blue Nile″ and ″White Nile″, respectively. The first jet service took place on 15 January 1963 (1963-01-15) when one of these aircraft was deployed on the route to Nairobi. The following day, a new service to Madrid was flown using the new jet equipment, with Frankfurt joining the jet network soon afterwards. On 1 April, the Boeing 720 replaced the DC-6B on the Addis Ababa–Athens route; during that month, the West African corridor also benefited from jet operations. The airline entered into a pool agreement with Aden Airways and Sudan Airways on the Khartoum–Asmara–Aden service. A new flight to Conakry was launched on 8 May 1963 (1963-05-08). Kano, which had been served since 18 March 1962 (1962-03-18), was removed from the list of destinations that day. On 30 November 1963, the airline lost another DC-3 (ET-AAT) in a test flight at Addis Ababa; the crew of three suffered minor injuries. Rome became served for the first time on 5 June 1964 (1964-06-05) on a weekly basis; the flight was routed via either Khartoum or Athens as part of a pool agreement with Alitalia. Also in the early 1960s, the carrier provided some initial aviation support to the Ethiopia-United States Mapping Mission in its operation to acquire topographic maps of Ethiopia. The firm changed from a corporation to a share company in 1965, and changed its name from Ethiopian Air Lines to Ethiopian Airlines. By 1966, the contractual relationship with TWA was adjusted to reflect the transfer of management with the appointment of an Ethiopian deputy general manager. Two Boeing 720s were in operation and a Boeing 707-320C was due to be phased in by March 1968 (1968-03), when the carrier ordered a second -320C. In 1970, the fifth renewal of the original 1945 contract changed TWA's role from manager to adviser. On its 25th anniversary in 1971, the company was ready to continue without foreign assistance. Since then, Ethiopian Airlines has been managed and staffed by Ethiopian personnel. The first Ethiopian General Manager was Col. Semret Medhane, appointed in 1971. Two Boeing 720Bs were acquired from Continental Airlines in 1973. In 1975, the carrier ordered five Dash 7s. By then, Ethiopian Airlines had ended its 30-year relationship with TWA. The airline became a new customer for the Boeing 727 in 1978, ordering two. The 727s arrived in the late 1970s as a replacement for the oldest Boeing 720s. The DHC-5 Buffalo entered Ethiopian's fleet in the early 1980s. In 1982, Ethiopian became the first African carrier in ordering the Boeing 767, as well as the first airline to order the Boeing 767-200ER. On 1984-6-1, the first of these aircraft set a new distance record for a twinjet, flying 7,500 miles (12,100 km) non-stop from Washington, D.C. to Addis Ababa, on delivery to the company. The Boeing 767-200ERs came to replace the remaining Boeing 720s. ATR-42s and Twin Otters were incorporated into the fleet in the mid-1980s, with the first of six Twin Otters entering the fleet in early 1985. The Boeing 737-200 joined the fleet in late 1987. In 1990, Ethiopian became the first passenger airline in taking delivery of the Boeing 757 Freighter, receiving the first of five Boeing 757-200s a year later. By 1996 the airline was flying to Bangkok, Beijing, Durban and Johannesburg; routes to Ivory Coast and Senegal were also being operated. Furthermore, the Fokker 50 entered the fleet to operate domestic routes; actually, Ethiopian became the last company in taking delivery of this aircraft in 1997, just after the collapse of Fokker due to financial problems. In the late 1990s the carrier saw the incorporation of Copenhagen and Maputo to its international network, as well as New York City and Washington as transatlantic destinations; the frequent flyer programme, named "Sheba Miles" after the legendary Queen of Sheba, was launched too. In 1998, the airline disrupted their flights to the Eritrean capital Asmara after a war erupted between the two countries. A fleet renewal started in the early 2000s, with the incorporation of the Boeing 737–700 and the Boeing 767-300ER; The airline discontinued its service to Newark in favour of serving Washington in 2004. In the late 2000s the airline announced it would be the launch customer of the Boeing 787 Dreamliner,[nb 1] and placed orders to acquire brand new Airbus A350-900s, Boeing 777-200LRs and Bombardier equipment. In late September 2010 (2010-09), Ethiopian Airlines was officially invited to join Star Alliance under the mentoring of Lufthansa. The carrier became a member of the alliance in December 2011 (2011-12), the third Africa-based carrier in doing so—following EgyptAir and South African Airways—and the 28th member worldwide. As of July 2016, the CEO of Ethiopian Airlines was Tewolde Gebremariam; he replaced Girma Wake in 2011. The airline, which is wholly owned by the Government of Ethiopia, has traditionally been unfettered by government intervention, even during times of significant turmoil and domestic hardship. Whereas many African state owned airlines were and remain often poorly run, with staffings often serving nepotistic purposes, and business decisions being made on political grounds, Ethiopian Airlines remained professionally run and managed, leading the Christian Science Monitor to term it in 1988 a "capitalist success in Marxist Ethiopia". The Derg, after expanding the airline's workforce, which had resulted in a decline in service quality and revenues, allowed the airline to be run on a "strictly commercial basis". Captain Mohammed Ahmed was appointed CEO in 1980, and slashed the workforce by 10%. The airline continued the acquisition of Western, rather than Soviet aircraft, despite the links between the communist government and the Soviet Union, purchasing the Boeing 727 in 1979 and the Boeing 767 in 1984. Despite famine, unfavorable exchange rates, and general economic disarray, the airline managed to retain its reputation, particularly in the provision of maintenance and training. The Financial Times noted that it managed to remain one of the most profitable airlines in Africa throughout the decade. Despite the violent overthrow of the communist government by the Ethiopian People's Revolutionary Democratic Front in 1991, the airline managed to post a profit for the fiscal year. The market-oriented policies of the new government meant that the airline would remain operationally independent, and under Captain Bisrat Nigatu the airline remained fiscally sound, despite disruptions caused by the Eritrean-Ethiopian War. Ethiopian Airlines currently has its head office at Bole International Airport, Addis Ababa, but intends to build a new head office facility. A contest for the design was held in 2009, but none of those plans were proceeded with. On 16 February 2011 it held a second round, and in September 2011 it was announced that BET Architect Plc won the contest. The airline stated that the estimated Br300 million complex will be constructed on a 50,000 m2 (540,000 sq ft) plot at Bole International Airport. The company that received 4th place in the competition's second round has threatened to take legal action, accusing the airline of not giving due consideration to the proposed design. The airline was featured by The Economist as an example of excellence in late 1987, and economist Paul B. Henze recognised it in 2000 as being "one of the most reliable and profitable airlines in the Third World". In July 2011 (2011-07), Ethiopian was named Africa's most profitable airline for the year 2010 by Air Transport World, and it has also been praised by AFRAA for its sustained profitability over recent years. As a long term company policy, in addition to the carrier's main activities, revenues are also generated by providing aircraft maintenance to foreign airlines, and specialist training for both Ethiopian and foreign trainees. Every year, pilots and technicians graduate from both the Pilot School, inaugurated in 1964, and the Aviation Maintenance Technician School, established in 1967. The American Federal Aviation Administration accredited the airline's maintenance division with license No. ETIY 102F. Ethiopian Airlines started “Vision 2010” in 2005, which aimed to increase passenger traffic to 3 million, revenue to US$1 billion and employees to 6,000 by 2010. By the year 2010 Ethiopian had exceeded all goals set in “Vision 2010”, and the company's net profit for the fiscal year ended 2010-6-30 was US$121.4 million. The results were attributed in part to an aggressive marketing campaign and major cost cutting measures. In 2010 Ethiopian adopted "Vision 2025", a 15-year development strategy, under which the airline anticipates increasing its fleet to 120, the number of destinations to 90, carrying more than 18 million passengers and 720,000 tonnes (710,000 long tons; 790,000 short tons) of cargo, with 17,000 employees. ″Vision 2025″ also considers a fourfold expansion of the capacity building for trainees in the airline's aviation academy. Ethiopian signed in July 2013 (2013-07) a deal for the acquisition of 49% of the Malawian carrier Air Malawi. The new airline will be named Malawian Airlines. The remaining shareholding will be held by the government of Malawi and private Malawian investors. Malawian Airlines started operations in January 2014 (2014-01). For the operation year 2013-14, Ethiopian Airlines was ranked the most profitable airline in Africa and 18th most profitable airline in the world with a profit of $228 million. As of October 2016, the carrier served 94 international and 19 domestic passenger destinations and 35 cargo destinations. Ethiopian serves more destinations in Africa than any other airline. As of April 2013, the carrier's five densest routes were Addis Ababa–Dubai, Addis Ababa–Johannesburg, Addis Ababa–Guangzhou, Addis Ababa–Nairobi and Addis Ababa–Beijing. In late April 2012 (2012-04), the airline said it planned to start serving the Latin American market but no firm dates were disclosed. In August that year, Abuja, Accra, Douala, Dubai, Entebbe, Frankfurt, Johannesburg, Harare, Kilimanjaro, Lagos, Lomé, London, Luanda, Lusaka, Malabo, Maputo, Mombasa, Mumbai, Nairobi and Rome would be served on an rotational basis with the first Boeing 787 Dreamliner, and that upon delivery of the second aircraft of the type these would be assigned on fixed scheduled routes. In February 2013 (2013-02), unofficial reports disclosed the carrier's plans to launch new services to Ho Chi Minh City, Manila and Seoul[nb 2] starting in June the same year, as well as the company's intention to start flying the 9,899-nautical-mile (18,333 km; 11,392 mi)-long São Paulo–Lomé–Addis Ababa–Guangzhou run in July 2013 (2013-07). In June 2013 (2013-06), unofficial sources reported that the launch of flights to both Ho Chi Minh City and Manila were cancelled, and that they will be replaced with a flight to Singapore starting in September 2013 (2013-09); as announced, flights to Rio de Janeiro and São Paulo commenced in July the same year. Flights to Singapore were launched in December 2013 (2013-12). A new link to Shanghai was launched in March 2014 (2014-03), while new services to Vienna started in June 2014 (2014-06) and to Doha in December the same year. Tokyo-Narita was added on 20 April 2015. Other new destinations are Los Angeles (the carrier's fifth point to be served in the Americas) and Dublin. A new service to Manila was launched in July 2015 (2015-07). The Addis Ababa–Lomé–Newark run is set to commence on 3 July 2016 (2016-07-03). In October 2007 (2007-10), Ethiopian Airlines' frequent flyer programme Shebamiles and Lufthansa's Miles & More entered into partnership, allowing members of each programme to earn and spend miles on both airlines' networks. In July 2008 (2008-07), the carrier entered a strategic partnership with Lomé-based start-up airline ASKY Airlines, in which Ethiopian holds a 40% stake. Ethiopian Airlines is responsible for aircraft maintenance and operational management. The plan is to turn Lomé into Ethiopian Airline's regional hub for the West African market. ASKY started operations in January 2010 and became profitable after a few months. Ethiopian officially joined Star Alliance in December 2011 (2011-12). In February 2005 (2005-02), Ethiopian Airlines signed a preliminary agreement to buy up to ten Boeing 787 Dreamliners (five firm orders plus five options), becoming the first African carrier to order 787s. On 31 May 2005 (2005-05-31), Boeing announced that Ethiopian had exercised its purchase rights and confirmed a firm order for ten aircraft. The carrier is the first African airline to order and to operate the Boeing 777-200LR. and took possession of its first (the 900th delivered 777 model) in November 2010 (2010-11). An Ethiopian Airlines Boeing 787 Dreamliner at Frankfurt Airport. The airline took delivery of the first aircraft of the type in August 2012 (2012-08). Issues related to the aircraft's lithium ion batteries forced a worldwide grounding of the type in January 2013 (2013-01); in late April that year, Ethiopian was the first airline to resume Boeing 787 operations. The company ordered eight Bombardier Q400s for US$242 million in November 2008 (2008-11) and took options on four more. During the 2009 Dubai Air Show, Ethiopian placed an order for 12 Airbus A350-900s, initially scheduled for delivery between 2016 and 2019. To date, this order is the largest placed by the airline, and it evidenced the company's dissatisfaction with Boeing for the delays in the delivery of the Dreamliners, initially scheduled to enter the fleet in June 2010 (2010-06). In January 2010 (2010-01), Ethiopian Airlines announced a firm order for ten Boeing 737-800 Next Generation aircraft in a deal worth US$767 million. The first 78-seater Q400 was acquired in March; in August, Ethiopian and the Ex-Im Bank signed an agreement worth US$1.6 billion for a loan to finance the acquisition of the ten Dreamliners (the first scheduled for delivery in mid-August 2012 (2012-08)) and the five Boeing 777s already in the fleet. In October 2011 (2011-10), the company announced an order for four Boeing 777Fs in a deal worth US$1.1 billion; Ethiopian Airlines is the first African carrier to order the aircraft. These four will join two others the airline will lease from GECAS. The first was received in mid September 2012 (2012-09). Five Q400 NextGens were ordered in February 2012 (2012-02) for US$160 million at list prices, whereas in July 2012 (2012-07), an additional Boeing 777-200LR was ordered in a deal worth US$276 million. [nb 3] In August 2012 (2012-08), the first Dreamliner was delivered to the airline, which became the third airline to operate the type on scheduled flights, preceded only by All Nippon Airways and Japan Airlines. Also in October 2012 (2012-10), the first Q400 NexGen was delivered, and in November the same year, the airline confirmed that three additional Dreamliners will be leased from ILFC, the first of them entering service in 2015. In April 2013 (2013-04), Air Lease Corporation and Ethiopian Airlines announced the lease of two Boeing 777-300ERs, with deliveries in May and June 2015 (2015-06). In early July the same year, Ex-Im Bank approved around US$130 million for Boeing to support the development of GE90-equipped long-haul aircraft for Ethiopian Airlines. The airline took delivery of its first Boeing 777-300ER in November 2013 (2013-11). That month, during the Dubai Air Show, Palma Holding signed a letter of intent with Bombardier for eight Q400s to be leased to Ethiopian; the order was firmed up in February 2014 (2014-02). In September 2014 (2014-09) the carrier announced a firm order for 20 Boeing 737 MAX 8s and commitments for 15 more. In January 2015 (2015-01), Ethiopian Airlines had the most numerous fleet in Africa. In 2015 the airline planned to buy 15 to 20 of Boeing's new 777X planes worth about $7.4 billion at list prices. Although the airline had initially planned to buy Airbus' A350-1000 jets, it switched to the 777X as it is more suitable for operations at their high-altitude hub in Addis Ababa. It was the first airline in Africa to acquire a Boeing 787 full-flight simulator. The airline received its first Airbus A350 XWB in late June 2016 (2016-06). Aside from the equipment shown above, the airline uses a number of DA40NGs for training purposes. Ethiopian Airlines had the largest dedicated cargo fleet in Africa, as of December 2013. Cloud Nine and Economy Class are the two classes available on most of Ethiopian Airlines' flights, but not on all-economy-layout Dash 8s. On all flights, passengers are provided with food and complimentary beverages on board, in both classes. The food service consists of hot meals, hot or cold snacks, or light refreshments, depending on the length of the flight and the time of the day. The choice of acquiring complementary drinks at an extra cost is available too. The airline also offers assorted menus for passengers having special meal requirements. 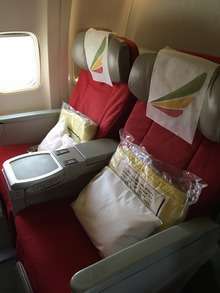 Ethiopian Airlines' Business Class is named Cloud Nine. Passengers travelling in this class are provided with onboard amenities and a wide variety of reading material. On routes operated with Boeing 777-200LR equipment passengers are provided with sleeper seats and on-demand audio and video services, with 85 channels on 15.4 inch IFE screens. A variety of meals —ranging from light snacks to hot dishes— and amenities are provided to passengers flying on this class, both depending upon the length of the flight. Reclining seats and on-demand audio and video, with 80 channels and 8.9-inched screens, are available on Boeing 777-200LR services. Ethiopian Airlines passengers are offered two lounges at Bole International Airport. Cloud Nine passengers can wait for the departure of flights at the Cloud Nine Lounge, where they are provided with a wide variety of amenities, as well as personal computers or wireless connection. Likewise, ShebaMiles cardholders with Gold or Silver status can make use of the Sheba Miles Lounge facilities. Customer Service agents are available at both lounges in order to assist passengers with any query regarding their flights. According to the Aviation Safety Network, Ethiopian Airlines records there have been 60 accidents and incidents since 1965, plus six more for Ethiopian Air Lines, the airline's former name. As of January 2013, these occurrences resulted in 337 deaths. One hijacking is the carrier's deadliest accident, when the plane plunged into the Indian Ocean due to fuel starvation in 1996. The second-deadliest accident occurred in 2010, when an aircraft crashed into the Mediterranean Sea, shortly after it departed Beirut–Rafic Hariri International Airport, killing all 90 people on board. The crash of a Boeing 737-200 in 1988 led to 35 fatalities and ranks as the third most deadly accident experienced by the company. Despite this, Ethiopian Airlines has a good safety record, in contrast to other African airlines. ↑ However, this did not happen. All Nippon Airways was the launch customer for this aircraft. ↑ There was an official confirmation for the commencement of services to this destination in May 2013 (2013-05). ↑ The airline took possession of this aircraft in early July 2013 (2013-07). ↑ Bekele, Kaleyesus (27 December 2014). "Abadula replaces Addisu as Ethiopian board chair". thereporterethiopia.com. Archived from the original on 2 March 2015. 1 2 3 "Executive Profile – Management Team". Ethiopian Airlines. Archived from the original on 15 May 2012. Retrieved 15 May 2012. 1 2 Davison, William. "Ethiopian Airlines Profit Rises 12 Percent in 2014-15". 1 2 3 4 "Ethiopian Airlines operating profit up 154% in FY2012". Centre for Aviation. 6 August 2013. Archived from the original on 30 August 2013. ↑ "Ethiopian Airlines - Star Alliance". staralliance.com. ↑ Blachly, Linda (20 June 2016). "Ethiopian Airlines set to receive Africa's first A350 XWB". Air Transport World. Archived from the original on 20 June 2016. ↑ "AFRAA Current Members – Ethiopian Airlines". African Airlines Association. 3 August 2011. Archived from the original on 15 May 2012. Retrieved 15 May 2012. ↑ "Profile on Ethiopian Airlines". Centre for Aviation. Archived from the original on 8 October 2012. Retrieved 29 December 2012. ↑ "Ethiopian Airlines". Ethiopian Airlines. 1 2 "Ethiopian Airlines – Bringing the Dreamliner to Africa". CNN. 3 September 2012. Archived from the original on 21 September 2012. Retrieved 4 January 2013. 1 2 "Ethiopian Airlines distinguished with African Cargo Airline Award". Sudan Tribune. 1 March 2011. Archived from the original on 10 May 2012. Retrieved 10 May 2012. ↑ "Well-connected: Why one national airline is bucking a continent-wide trend". The Economist. Addis Ababa. 2016-10-22. Archived from the original on 2016-10-31. Retrieved 2016-10-31. 1 2 3 "Ethiopian Airlines Named "Africa's Most Profitable Airlines" for the Third Time in a Row" (Press release). Ethiopian Airlines. 21 July 2011. Archived from the original on 10 May 2012. Retrieved 10 May 2012. ↑ "Ethiopian Cargo Wins "AFRICAN CARGO AIRLINE OF THE YEAR" Award" (Press release). Ethiopian Airlines. 25 February 2011. Archived from the original on 10 May 2012. Retrieved 10 May 2012. ↑ "A ETHIOPIAN IL PREMIO LINEA AEREA CARGO DELL'ANNO" ["Cargo Airline of the Year" awarded to Ethiopian] (in Italian). AGI News On. Agenzia Giornalistica Italia. 1 March 2011. Archived from the original on 9 March 2012. Retrieved 4 March 2011. ↑ "ATW's 41st Annual Airline Industry Achievement Awards". atwonline.com. ↑ "Ethiopian Airlines Established 1945". Ethiopian Airlines Former Employees Association. 2007. Archived from the original on 3 July 2012. Retrieved 3 July 2012. 1 2 3 4 "Profile: Ethiopian Airlines". BBC News. 25 January 2010. Archived from the original on 26 April 2012. Retrieved 26 April 2012. 1 2 3 4 5 6 Ofcansky, David H. Shinn, Thomas P.; David H. Shinn (2004). Historical Dictionary of Ethiopia. (New ed.). Lanham: Rowman & Littlefield Pub. Group. pp. 143–144. ISBN 978-0-8108-6566-2. Retrieved 4 February 2013. 1 2 3 4 5 6 7 8 9 10 11 12 13 14 15 16 17 18 19 20 "History". Ethiopian Airlines. Archived from the original on 20 June 2013. 1 2 "Ethiopian Airlines SC". Flight International: 485. 20 March 1975. Archived from the original on 15 May 2012. Retrieved 15 May 2012. 1 2 3 4 "Company Profile". Ethiopian Airlines. Retrieved 26 September 2014. ↑ "Airlines of the world – Ethiopian Airlines Inc". Flight. 77 (2665): 499. 8 April 1960. Archived from the original on 29 July 2013. 1 2 3 4 5 6 7 8 Guttery (1998), p. 59. ↑ Perlez, Jane (9 August 1988). "Against the Odds, Airline Takes Off and Flies High". The New York Times. Archived from the original on 26 April 2012. Retrieved 26 April 2012. ↑ "Air commerce...". Flight International: 1068. 24 December 1964. Archived from the original on 26 April 2012. Retrieved 26 April 2012. Mr John F. Forsyth has been appointed general sales manager of Ethiopian Airlines in succession to Mr J. I. Greenwald who was appointed general manager on July 1. Mr Forsyth was director, sales training, for TWA, which has assisted Ethiopian since its formation in 1945. ↑ "Ethiopian Airlines International Schedules (Effective 1 June 1952)". Airline Timetable Images. Archived from the original on 15 May 2012. Retrieved 15 May 2012. 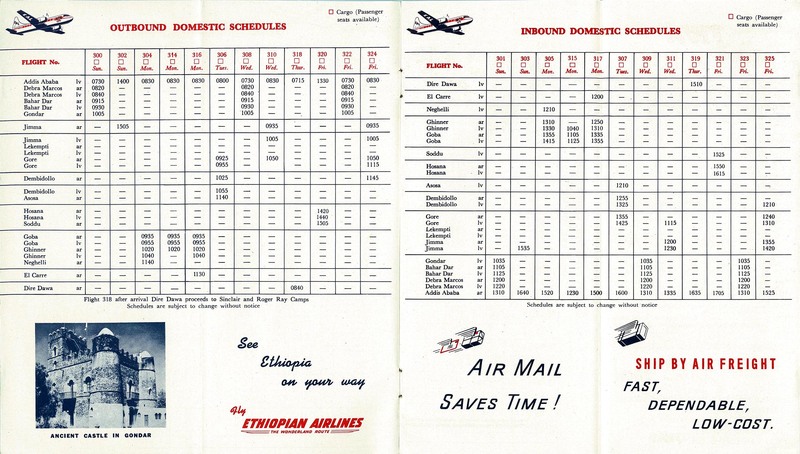 ↑ "Ethiopian Airlines Domestic Schedules (Effective 1 June 1952)". Airline Timetable Images. Archived from the original on 15 May 2012. Retrieved 15 May 2012. ↑ Guttery (1998), p. 59–60. 1 2 3 4 Guttery (1998), p. 60. ↑ "Brevities". Flight: 108. 20 July 1950. Archived from the original on 21 September 2012. Retrieved 21 September 2012. The U.S. Export-Import Bank has granted a credit of up to one million dollars to Ethiopian Airlines, Inc., to assist in the purchase of two Convairliners and spare parts for dollars. The aircraft will be used on the company's international services, and will permit the DC-3S now used on these routes to augment the services within Ethiopa [sic]. ↑ "Civil aviation – Ethiopian progress". Flight. LIX (2206): 539. 4 May 1951. Archived from the original on 21 September 2012. ↑ "Brevities". Flight: 449. 11 April 1952. Archived from the original on 26 September 2012. Retrieved 26 September 2012. Trans World Airlines have appointed Ethiopian Air Lines as their general agents in Kenya, Tanganyika, Uganda and Zanzibar. 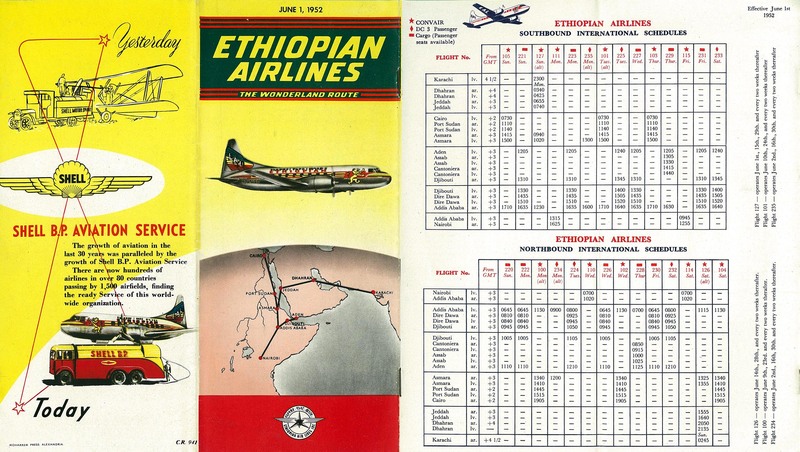 ↑ "The World's Airlines – A Directory of Operators and Their Fleets—Ethiopian Air Lines, Inc.". Flight: 593. 16 May 1952. Archived from the original on 26 September 2012. Retrieved 26 September 2012. 1 2 3 4 5 6 7 Guttery (1998), p. 61. ↑ "Civil aviation...". Flight. 66 (2383): 501. 24 September 1954. Archived from the original on 2 January 2014. J.A.T.O. is sometimes used by the two Convair 240s operated from Addis Ababa, 8,000ft above sea level, by Ethiopian Airlines. ↑ "World airline directory – Ethiopian Air Lines, Inc.". Flight. 69 (2465): 470. 20 April 1956. Archived from the original on 2 January 2014. 1 2 "Civil aviation...". Flight. 71 (2507): 194. 8 February 1957. Archived from the original on 26 September 2012. Ethiopian Airlines have purchased two DC-6Bs and taken an option on a third with credit obtained from the United States Export Import Bank. ↑ "Brevities". Flight: 727. 4 November 1955. Archived from the original on 26 September 2012. Retrieved 26 September 2012. It is expected that part of an £8.5m U.S. loan to Ethiopia for the development of civil aviation will be used to buy new American aircraft, of unspecified type, for Ethiopian Air Lines. The purchase of the two Convair 240s used by the company was financed by the same source—the Export-Import Bank of Washington. ↑ "Civil aviation...". Flight: 722. 23 May 1958. Archived from the original on 3 July 2012. Retrieved 3 July 2012. Due to be inaugurated tomorrow, May 24, is a new Ethiopian Airlines service from Addis Ababa to Cairo and Athens. Here is one of the airline's three new DC-6Bs, recently delivered by Douglas to Ethiopia. ↑ "Civil aviation... – Ethiopian expansion". Flight: 928. 12 December 1958. Archived from the original on 3 July 2012. Retrieved 3 July 2012. Since early last summer these aircraft have been operating from Frankfurt to Nairobi via Addis Ababa. 1 2 3 4 Guttery (1998), p. 62. ↑ Guttery (1998), p. 61–62. ↑ "Brevities". Flight: 489. 21 September 1961. Archived from the original on 3 July 2012. Saudi Arabian Airlines has ordered two Boeing 720B medium jets; these two were originally ordered by Ethiopian Airlines, which has reordered the same number for delivery in October and November next year because construction of the new jet airport for Addis Ababa has only just begun. ↑ "Ethiopia-United States Mapping Mission". Archived from the original on 3 July 2012. ↑ "Air transport – Second -320C for Ethiopian". Flight International. 93 (3081). 28 March 1968. Archived from the original on 29 July 2013. ↑ "Airlines updated". Flight International: 86. 19 July 1973. Archived from the original (PDF) on 3 July 2012. Retrieved 3 July 2012. Ethiopian has bought two Boeing 720-024Bs from Continental. Delivery is scheduled for October 1 this year and 1 October 1974. Ethiopian has also taken an option on six more. ↑ "Ethiopian chooses 767ER". Flight International. Addis Ababa: 3. 1 January 1982. Archived from the original on 31 July 2012. Retrieved 31 July 2012. ↑ "Ethiopian picks P&W". Flight International: 1107. 23 April 1983. Archived from the original on 31 July 2012. Retrieved 31 July 2012. ↑ "Boeing 7-Series – Fast Facts: Boeing 767". Boeing. Archived from the original on 20 April 2012. Retrieved 3 July 2012. On June 1, 1984, the first 767-200ER for Ethiopian Airlines set a twinjet airliner distance record—flying 7,500 statute miles (12,082 kilometers) from Washington, D.C., to Addis Ababa, Ethiopia, in 13 hours and 17 minutes. ↑ "Market Place". Flight International: 7. 16 February 1985. Archived from the original on 31 July 2012. Retrieved 31 July 2012. Ethiopian Airlines has taken delivery of the first of six Twin Otters. ↑ "Ethiopia takes 737–200". Flight International: 6. 28 November 1987. Archived from the original on 31 July 2012. Retrieved 31 July 2012. ↑ "Ethiopian score Boeing first". Flight International. 138 (4233): 35. 12–18 September 1990. ISSN 0015-3710. Archived from the original on 11 January 2015. ↑ "Ethiopian receives 757". Flight International. 139 (4260): 10. 2 April 1991. ISSN 0015-3710. Archived from the original on 14 May 2013. ↑ "The Fokker 50: Facts and figures". Luxembourg: CNN. 6 November 2002. Archived from the original on 21 September 2012. Retrieved 21 September 2012. In all, 205 Fokker 50s were built, but Fokker collapsed due to financial problems in 1996 and the last Fokker 50 was delivered to Ethiopian Airlines a year later. ↑ Dufka, Corinne. "Ethiopia to resume commercial flights to north". Reuters. ↑ Pineau, Carol (6 December 1998). "Eritrea transport". Voice of America. Archived from the original on 7 April 2014. ↑ "Ethiopian Airlines Heads Home with New Boeing 767-300ER" (Press release). Boeing. 25 November 2003. Archived from the original on 3 July 2012. Ethiopian Airlines headed home with its first new 767-300ER Tuesday following a double delivery ceremony for this airplane and also the airline's first 737–700. ↑ Hofmann, Kurt (3 February 2016). "Ethiopian Airlines confirms comeback of New York flights". Air Transport World. Archived from the original on 4 February 2016. ↑ Walker, Karen (27 March 2012). "JAL takes delivery of its first 787s". Air Transport World. Archived from the original on 21 September 2012. All Nippon Airways (ANA) was the first airline to take delivery of the 787 in October. ↑ Ostrower, Jon (27 September 2011). "ANA's first 787 heads for Japan". Seattle: Flightglobal. Archived from the original on 21 September 2012. Retrieved 21 September 2012. ↑ "Boeing completes delivery of first B787 to ANA". Centre for Aviation. 26 September 2011. Archived from the original on 21 September 2012. Retrieved 21 September 2012. ↑ Buyck, Cathy (30 September 2010). "Ethiopian Airlines set to join Star Alliance". Air Transport World. Archived from the original on 18 April 2012. Retrieved 18 April 2012. ↑ "Ethiopian Airlines accepted as future Star Alliance member carrier" (PDF) (Press release). Star Alliance. 29 September 2010. Archived from the original (PDF) on 1 January 2014. ↑ "Ethiopian Airlines Accepted as Future Star Alliance Member Carrier" (Press release). Ethiopian Airlines. 29 September 2010. Archived from the original on 28 June 2014. ↑ Hofmann, Kurt (14 December 2011). "Ethiopian increases Star Alliance presence in Africa". Air Transport World. Archived from the original on 18 April 2012. Retrieved 26 September 2012. ↑ "Ethiopian Airlines joins Star Alliance". Flightglobal. 13 December 2011. Archived from the original on 18 April 2012. Retrieved 26 September 2012. ↑ Moores, Victoria (18 July 2016). "Ethiopian Airlines signs parts manufacturing agreement". Air Transport World. Archived from the original on 21 July 2016. ↑ "Ethiopia - How Girma Wake Changed Ethiopian Airlines?". Nazret.com. 4 January 2011. Archived from the original on 24 December 2013. Koch, Kathy (22 November 1988). "West Africa tries to make its state-owned airlines fly right. Managing a capitalist success in Marxist Ethiopia". Christian Science Monitor. Archived from the original on 28 June 2014. 1 2 Gebregziabher, Selamawit (June 2012). "Why Ethiopian Airlines Becomes Successful and What are the Lessons for other Public Companies?" (PDF). Archived (PDF) from the original on 19 September 2013. 1 2 "Annual Report 2004". Ethiopian Airlines. Retrieved 3 January 2013. ↑ "Annual Report 2005". Ethiopian Airlines. Retrieved 3 January 2013. ↑ "Annual Report 2006". Ethiopian Airlines. Retrieved 3 January 2013. ↑ "Annual Report 2007". Ethiopian Airlines. Retrieved 3 January 2013. ↑ "Annual Report 2008". Ethiopian Airlines. Retrieved 3 January 2013. ↑ "Annual Report 2009". Ethiopian Airlines. Retrieved 3 January 2013. ↑ "Annual Report 2010". Ethiopian Airlines. Retrieved 3 January 2013. ↑ "Annual Report 2010-2011" (PDF). Centre for Aviation. 22 March 2012. Archived from the original (PDF) on 28 June 2014. ↑ "Annual report 2011-12" (PDF). Centre for Aviation. Archived from the original (PDF) on 30 August 2013. ↑ Tadesse, Kirubel (31 August 2013). "Ethiopian Airlines: Dreamliner Boosted Profits". Associated Press. Archived from the original on 13 September 2013. Retrieved 8 September 2013. ↑ "Dreamliner lauded as Ethiopian Air reports record profit". USA Today. Retrieved 29 October 2014. ↑ "Ethiopian Airlines grows 13% in FY13; nine European points served". anna.aero. Retrieved 29 October 2014. ↑ "Annual Report 2013". Ethiopian Airlines. Retrieved 22 January 2015. ↑ "Ethiopian Airlines Made 3.15 Billion Birr Profit". 2merkato.com. ↑ "Annual Report 2014" (PDF). Ethiopian Airlines. Retrieved 5 December 2015. ↑ "In Search of Excellence, the Hard Way", The Economist, 31 December 1987. ↑ Paul B. Henze, Layers of Time: A History of Ethiopia, (New York: Palgrave, 2000), p. 246. ↑ "Ethiopian Airlines Receives the AFRAA Award" (Press release). Ethiopian Airlines. 25 November 2011. Archived from the original on 25 April 2012. Retrieved 25 April 2012. ↑ Gubisch, Michael (27 February 2013). "Ethiopian MRO Services enters CFM56 overhaul market". London: Flightglobal. Archived from the original on 21 June 2013. ↑ "Annual Report 2007/08". Ethiopian Airlines. Archived from the original on 5 November 2013. Retrieved 9 June 2012. ↑ "Ethiopian Aviation Academy Graduated Pilots and Aviation Maintenance Technicians" (Press release). Ethiopian Airlines. 30 April 2012. Archived from the original on 9 June 2012. ↑ "Ethiopian Graduates Aviation Technicians from Six African Countries" (Press release). Ethiopian Airlines. 29 April 2010. Archived from the original on 9 June 2012. ↑ "Maintenance, Repair & Overhaul | About Us – Approval and Accreditations". Ethiopian Airlines. Archived from the original on 23 May 2012. ↑ "Ethiopian Airlines Pioneer of African Aviation Industry". Ministry of Foreign Affairs of Ethiopia. Archived from the original on 23 May 2012. ↑ Ethiopian | Press Releases | Press Releases Archived 3 April 2015 at the Wayback Machine. ↑ Tadesse, Tsegaye (7 August 2009). "Ethiopian Airlines 08/09 net profit leaps 165 pct". Reuters. Archived from the original on 25 April 2012. Retrieved 25 April 2012. ↑ "Profits drop 40% at Ethiopian Airlines". Ethiopian Review. 12 August 2012. Archived from the original on 4 January 2013. Retrieved 4 January 2013. ↑ Moores, Victoria (9 July 2013). "Reports: Ethiopian Airlines, Air Malawi finalize deal". Air Transport World. Archived from the original on 11 July 2013. ↑ Moores, Victoria (15 July 2013). "Ethiopian Airlines confirms Malawian Airlines joint venture". Air Transport World. Archived from the original on 15 July 2013. ↑ "Ethiopian Becomes Strategic Partner in New Malawi Airlines" (Press release). Ethiopian Airlines. 13 July 2013. Archived from the original on 18 July 2013. ↑ Mvula, Mlenga (16 February 2014). "Malawian Airlines Receives Another Aircraft". AllAfrica.com. Malawi News Agency. Archived from the original on 23 February 2014. ↑ "Ethiopian Airlines announces record 46 billion Birr profit". Zegabi. ↑ "Ethiopian Airlines". Ethiopian Airlines. Retrieved 10 October 2016. ↑ "Ambassador impressed by Ethiopian Airlines". Royal Norwegian Embassy in Addis Ababa. 22 September 2009. Archived from the original on 26 April 2012. Retrieved 26 April 2012. ↑ "Ethiopian Airlines expands its global footprint to link the world's high growth regions". Centre for Aviation. 12 April 2013. Archived from the original on 14 April 2013. ↑ "Etihad and Ethiopian plan services to Sao Paulo as Latin America-Asia market prepares to grow". Centre for Aviation. 25 April 2012. Archived from the original on 25 April 2012. ↑ "Ethiopian Dreamliner Continues Serving Rotating African Destinations" (Press release). Ethiopian Airlines. 23 August 2012. Archived from the original on 23 August 2012. Retrieved 23 August 2012. 1 2 "Dreams Become Destinations Rotating Routes for 1st Ethiopian Dreamliner" (Press release). Ethiopian Airlines. 9 August 2012. Archived from the original on 11 August 2012. Retrieved 11 August 2012. ↑ "Ethiopian to Start Flights to Seoul" (Press release). Ethiopian Airlines. 7 May 2013. Archived from the original on 27 May 2013. ↑ "Ethiopian Airlines extends its Asian reach and links South America with China". Centre for Aviation. 19 February 2013. Archived from the original on 21 February 2013. ↑ Duclos, François (20 June 2013). "Ethiopian Airlines atterrit à Séoul, ajoute Singapour" [Ethiopian Airlines arrives in Seoul, adjusts Singapore] (in French). Air Journal. Archived from the original on 20 June 2013. ↑ "Ethiopian adds South America to its Network with new Services to Rio de Janeiro and Sao Paulo" (Press release). Ethiopian Airlines. 1 July 2013. Archived from the original on 1 July 2013. ↑ "Ethiopian Airlines to continue Asia expansion with Singapore non-stops, giving Changi a needed boost". CAPA Centre for Aviation. 3 October 2014. Archived from the original on 3 October 2014. ↑ "Ethiopian commences flights to Singapore" (Press release). Ethiopian Airlines. 5 December 2013. Archived from the original on 10 December 2013. ↑ "Ethiopian Launches First Direct Flight Between Shanghai and Africa" (Press release). Ethiopian Airlines. 1 April 2014. Archived from the original on 3 April 2014. ↑ "Ethiopian Starts Services to Vienna, its ninth European Destination" (Press release). Ethiopian Airlines. 2 June 2014. Archived from the original on 5 June 2014. ↑ "Ethiopian Starts Flights to Doha" (Press release). Ethiopian Airlines. 2 December 2014. Archived from the original on 3 April 2015. ↑ "Ethiopian Airlines to Start flights to Tokyo" (Press release). Ethiopian Airlines. 11 January 2015. Retrieved 29 January 2015. ↑ Moores, Victoria (7 November 2014). "Ethiopian Airlines to add Doha, Dublin and LA". Air Transport World. Archived from the original on 7 November 2014. ↑ Torr, Jeremy (20 July 2015). "Ethiopian opens new Africa-South Asia route". Air Transport World. Archived from the original on 24 July 2015. ↑ Hofmann, Kurt (18 April 2016). "Ethiopian Airlines to serve New York-Newark with Boeing 787". Air Transport World. Archived from the original on 19 April 2016. ↑ "Ethiopia – ShebaMiles and Lufthansa Miles & More Enter into Partnership". nazret.com. 29 October 2007. Archived from the original on 3 June 2012. Retrieved 3 June 2012. ↑ "Other News – 07/07/2008". Air Transport World. 8 July 2008. Archived from the original on 23 August 2012. Ethiopian Airlines and privately held Togolese startup ASKY signed an MOU to form a strategic partnership covering marketing, operations, maintenance, training, financing and management contracts, ET announced. ↑ "ASKY Airlines eyes expansion to Southern Africa and Europe as it celebrates its third birthday". Centre for Aviation. 2 June 2013. Archived from the original on 3 June 2013. ↑ Hofmann, Kurt (13 June 2011). "Ethiopian Airlines-affiliated ASKY eyeing long-haul routes". Air Transport World. Archived from the original on 10 May 2012. Retrieved 10 May 2012. ↑ Hofmann, Kurt (11 June 2010). "Ethiopian moves to broaden foothold in Africa". Air Transport World. Archived from the original on 23 August 2012. Retrieved 23 August 2012. "ASKY has become profitable already," Wake told ATWOnline this week on the sidelines of the IATA AGM in Berlin. 1 2 Flint, Perry; Karp, Aaron (21 January 2010). "Ethiopian orders 10 737-800s, launches West African airline". Air Transport World. Archived from the original on 23 August 2012. ↑ "Ethiopian Airlines joins Star Alliance" (PDF) (Press release). Star Alliance. 13 December 2011. Archived from the original (PDF) on 15 May 2012. Retrieved 9 June 2012. ↑ "Ethiopian Airlines joins Star Alliance". London: Flightglobal. 13 December 2011. Archived from the original on 25 April 2012. ↑ "Ethiopian Airlines Joins Star Alliance" (Press release). Ethiopian Airlines. 13 December 2011. Archived from the original on 25 April 2012. ↑ "Profile on Ethiopian Airlines". CAPA. Centre for Aviation. Archived from the original on 2016-10-31. Retrieved 2016-10-31. ↑ "Ethiopian, Air China move forward on codeshare". Air Transport World. 17 December 2010. Archived from the original on 25 April 2012. Ethiopian Airlines and Air China signed an agreement under which the carriers will codeshare on their 14 weekly services between Addis Ababa on the one hand and Guangzhou and Beijing on the other. ↑ "Ethiopian Signs Code Share Deal with Air China" (Press release). Ethiopian Airlines. 15 December 2010. Archived from the original on 25 April 2012. ↑ "Ethiopian and Air India Expand Codeshare" (Press release). Ethiopian Airlines. 11 January 2015. Archived from the original on 8 May 2015. ↑ "Airline Routes-Oct. 27, 2014". Air Transport World. 27 October 2014. Archived from the original on 28 October 2014. All Nippon Airways and Ethiopian Airlines, both member of the Star Alliance, began codesharing Oct. 26. ANA passengers can book connecting flights on Ethiopian between Addis Ababa and Bangkok, Hong Kong, Frankfurt, Paris, London, Nairobi and Mombasa. Ethiopian will place its code on ANA Bangkok and Hong Kong services. ↑ "Star Alliance Members, Ethiopian and ANA, Launch Code-Shar [sic]" (Press release). Ethiopian Airlines. 17 October 2014. Archived from the original on 12 February 2015. ↑ "Star Alliance Members, Ethiopian and ANA, Launch Code-Share" (PDF) (Press release). All Nippon Airways. 17 October 2014. Archived from the original (PDF) on 21 October 2014. ↑ Hashim, Firdaus (2 September 2011). "Ethiopian Airlines to code share with Asiana". Singapore: Flightglobal. Archived from the original on 25 April 2012. ↑ "Ethiopian Signs Code Share Agreement with Asiana Airlines" (Press release). Ethiopian Airlines. 29 August 2011. Archived from the original on 25 April 2012. ↑ Clark, Oliver (4 June 2014). "Ethiopian and Austrian sign codeshare". Flightglobal. London. Archived from the original on 28 July 2014. ↑ "Star Alliance Members, Ethiopian and Austrian Airlines, Enter into Codeshare Agreement" (Press release). Ethiopian Airlines. 4 June 2014. Archived from the original on 5 June 2014. ↑ "Ethiopian Code Share with Mozambique Airlines" (Press release). Ethiopian Airlines. 4 May 2011. Archived from the original on 10 May 2012. Retrieved 10 May 2012. ↑ "Ethiopian Enhances Cooperation with Lufthansa" (Press release). Ethiopian Airlines. 18 November 2009. Archived from the original on 10 May 2012. Retrieved 10 May 2012. ↑ "Ethiopian Strengthens Codeshare with Lufthansa" (Press release). Ethiopian Airlines. 1 December 2008. Archived from the original on 10 May 2012. Retrieved 10 May 2012. ↑ "Ethiopian Airlines and Oman Air Enter in to Code Share Agreement" (Press release). Ethiopian Airlines. 2 April 2013. Archived from the original on 20 June 2013. ↑ "Ethiopian Code share with Scandinavian Airlines" (Press release). Ethiopian Airlines. 28 March 2010. Archived from the original on 31 July 2012. Retrieved 31 July 2012. ↑ "SIA and Ethiopian Airlines Expand Codeshare Agreement" (Press release). Ethiopian Airlines. 26 November 2013. Archived from the original on 6 December 2013. ↑ "Ethiopian Airlines and South African Airways Enhance Cooperation" (Press release). Ethiopian Airlines. 9 September 2010. Archived from the original on 3 June 2012. ↑ "Tap and Ethiopian enter into Code-share Agreement" (Press release). Ethiopian Airlines. 15 April 2015. Archived from the original on 27 April 2015. ↑ "Airline Routes". Air Transport World. 28 August 2014. Archived from the original on 28 August 2014. Ethiopian Airlines and United Airlines will begin codesharing Aug. 30 on Addis Ababa-Washington Dulles service and other points in Ethiopia and the US. The airlines are both Star Alliance members. ↑ "Ethiopian Enters into Codeshare Agreement with United Airlines" (Press release). Ethiopian Airlines. 13 August 2014. Archived from the original on 3 April 2015. ↑ "Ethiopian CEO tours the Airline's 787 Dreamliner ahead of delivery". Centre for Aviation. 18 April 2012. Archived from the original on 20 April 2012. ↑ "Ethiopian Airlines Increases 787 Dreamliner Order by Five Airplanes" (Press release). Boeing. 31 May 2005. Archived from the original on 3 July 2012. Boeing [NYSE: BA] and Ethiopian Airlines today said the airline has increased its firm orders for the 787 Dreamliner to 10 airplanes by exercising purchase rights obtained with its initial order announced Feb 4. ↑ Morgan, Adam (April 2011). "Capital investment" (PDF). Boeing. Archived from the original (PDF) on 2 March 2013. ↑ David Lilienthal (22 November 2010). "Exclusive Look On-Board Ethiopian Airlines' First Boeing 777-200LR: Photo Gallery". NYCAviation. Archived from the original on 22 January 2013. Retrieved 29 July 2011. As NYCAviation reported last Wednesday, Ethiopian Airlines took delivery of a significant airplane: ET-ANN is Ethiopian’s first 777, the African continent’s first −200LR and the 900th 777 to roll off of Boeing’s assembly lines. ↑ "Ethiopian Takes Delivery of The First 777-200LR" (Press release). Ethiopian Airlines. 20 November 2010. Archived from the original on 9 June 2012. Retrieved 9 June 2012. ↑ "Boeing Delivers Its 900th 777 Airplane to Ethiopian Airlines". Boeing. 17 November 2010. Archived from the original on 3 July 2012. Retrieved 3 July 2012. 1 2 Yeo, Ghim-Lay (17 August 2012). "Ethiopian's first 787 arrives at Addis Ababa". Addis Ababa: Flightglobal.com. Archived from the original on 19 August 2012. Retrieved 19 August 2012. ↑ Walker, Karen (15 March 2013). "Boeing: Battery fix eliminates all risk of fire". Air Transport World. Archived from the original on 30 April 2013. ↑ Rivers, Martin (17 January 2013). "Ethiopian Airlines becomes final carrier to ground 787s". London: Flightglobal. Archived from the original on 30 April 2013. ↑ Walker, Karen (29 April 2013). "Ethiopian is first airline to resume 787 flights". Air Transport World. Archived from the original on 30 April 2013. ↑ "Guinea Pig Flight: Ethiopian Airlines first to fly Dreamliner". The Zimbabwe Mail. Reuters. 27 April 2013. Archived from the original on 1 May 2013. ↑ "Ethiopian Purchases Eight Q400 Aircrafts [sic] from Bombardier" (Press release). Ethiopian Airlines. 21 November 2008. Archived from the original on 2 January 2014. ↑ "Ethiopian Signs Firm Order for Twelve A350 XWBs" (Press release). Ethiopian Airlines. 15 November 2009. Archived from the original on 13 November 2013. ↑ "Ethiopian Airlines aims to become the largest carrier in Africa by 2025". Centre for Aviation. 4 November 2011. Archived from the original on 17 July 2012. ↑ "Boeing, Ethiopian Airlines Announce Order for 10 737-800s" (Press release). Boeing. 22 January 2010. Archived from the original on 14 May 2013. ↑ "Ethiopian Orders Ten 737-800s" (Press release). Ethiopian Airlines. 21 January 2010. Archived from the original on 2 January 2014. ↑ "Ethiopian Receives the First Q-400 Aircraft" (Press release). Ethiopian Airlines. 21 March 2010. Archived from the original on 2 January 2014. ↑ Karp, Aaron (6 August 2012). "Ethiopian to become first non-Japanese airline to receive 787 next week". Air Transport World. Archived from the original on 11 August 2012. Retrieved 11 August 2012. ↑ "Ethiopian and the US Export-Import Bank Sign $1.6 Billion Agreement" (Press release). Ethiopian Airlines. 10 August 2010. Archived from the original on 9 June 2012. ↑ "Ethiopian Airlines, Boeing Announce Order for Four 777 Freighters" (Press release). Ethiopian Airlines. 5 October 2011. Archived from the original on 3 July 2012. Retrieved 3 July 2012. ↑ Blachly, Linda (6 October 2011). "Ethiopian Airlines is customer for four unidentified 777Fs". Air Transport World. Archived from the original on 3 July 2012. Retrieved 21 July 2012. ↑ Ostrower, Jon (5 October 2011). "Ethiopian to grow Boeing 777F fleet to six". Flightglobal.com. Archived from the original on 21 July 2012. Retrieved 21 July 2012. ↑ "Ethiopian Receives Africas First Boeing 777 Freighter" (Press release). Ethiopian Airlines. 19 September 2012. Archived from the original on 20 September 2012. Retrieved 20 September 2012. ↑ "Bombardier Gets Order For 2 Q400 NextGen". Airwise News. Reuters. 16 February 2012. Archived from the original on 11 January 2013. Retrieved 11 January 2013. ↑ Hashim, Firdaus (20 July 2012). "Ethiopian Airlines orders additional Boeing 777-200LR". Flightglobal.com. Archived from the original on 21 July 2012. Retrieved 21 July 2012. ↑ Blachly, Linda (19 July 2012). "Ethiopian Airlines orders an additional 777". Air Transport World. Archived from the original on 19 July 2012. Retrieved 19 July 2012. ↑ "Ethiopian Airlines Announce Order for Additional 777-200LR" (Press release). Boeing. 19 July 2012. Archived from the original on 21 July 2012. Retrieved 21 July 2012. ↑ Moores, Victoria (3 July 2013). "Ethiopian Airlines takes delivery of Boeing 777-200LR". Air Transport World. Archived from the original on 3 July 2013. ↑ "Ethiopian Takes Delivery of 1st Dreamliner" (Press release). Ethiopian Airlines. 14 August 2012. Archived from the original on 17 August 2012. Retrieved 17 August 2012. ↑ "Boeing Celebrates Delivery of the First Ethiopian Airlines' First 787" (Press release). Boeing. 14 August 2012. Archived from the original on 15 August 2012. Retrieved 15 August 2012. ↑ Russell, Edward. "Ethiopian receives first 787". Washington, D.C.: Flightglobal.com. Archived from the original on 15 August 2012. Retrieved 15 August 2012. ↑ Hofmann, Kurt (3 October 2012). "Ethiopian reconfigures Dash 8 Q400 fleet". Air Transport World. Archived from the original on 4 October 2012. ↑ "Ethiopian Adds Three B787s With Long-Term Lease Agreement With ILFC" (Press release). Ethiopian Airlines. 9 November 2012. Archived from the original on 4 December 2014. ↑ Blachly, Linda (2 November 2012). "Ethiopian Airlines to lease three 787s from ILFC". Air Transport World. Archived from the original on 3 November 2012. Retrieved 3 November 2012. ↑ "Aircraft News". Air Transport World. 25 April 2013. Archived from the original on 26 April 2013. Air Lease Corp. announced a lease agreement with Ethiopian Airlines for two new Boeing 777-300ER aircraft, both on lease for 12 years. The aircraft are scheduled for delivery in May and June 2015. ↑ "Ethiopian Leases Two New Boeing 777- 300ERs from Air Lease Corporation" (Press release). Ethiopian Airlines. 22 April 2013. Archived from the original on 27 April 2013. ↑ "Aircraft News". Air Transport World. 1 July 2013. Archived from the original on 3 July 2013. ↑ "Boeing Delivers Ethiopian Airlines First 777-300ER" (Press release). Ethiopian Airlines. 7 November 2013. Archived from the original on 28 June 2014. ↑ Moores, Victoria (4 February 2014). "Palma Holding firms up to eight Bombardier Q400s for Ethiopian Airlines". Air Transport World. Archived from the original on 22 February 2014. ↑ Walker, Karen (22 September 2014). "Ethiopian Airlines orders 20 Boeing MAXs plus 15 options". Air Transport World. Archived from the original on 21 September 2014. ↑ Russell, Edward (20 September 2014). "Ethiopian orders up to 35 737 Max 8s". Chicago: Flightglobal. Archived from the original on 21 September 2014. ↑ "Ethiopian Airlines 2015 outlook: more rapid expansion as it becomes Africa's largest airline". CAPA Centre for Aviation. 13 January 2015. Archived from the original on 13 January 2015. ↑ "Zacks Equity Research". 9 October 2015. ↑ Blachly, Linda (27 January 2015). "Airline News-Jan. 27, 2015". Air Transport World. Archived from the original on 13 February 2015. Ethiopian Airlines has acquired the first-ever Boeing 787 full-flight simulator (FFS) in Africa. The installation and buildup of the FFS is in progress at Ethiopian’s main hub in Addis Ababa and the first pilot training will start in March 2015. ↑ Hofmann, Kurt (29 June 2016). "CEO: A350 XWB takes Ethiopian Airlines 'to the next level'". Air Transport World. Archived from the original on 3 July 2016. ↑ "Ethiopian Airlines Current Fleet". Ethiopian Airlines. Archived from the original on 26 September 2016. Flottau, Jens (21 August 2012). "After 787 Delivery Ethiopian's Plan Now Calls For Narrowbody Order (page 1)". Aviation Week. Aviation Daily. Archived from the original on 21 August 2012. Retrieved 21 August 2012. "After 787 Delivery Ethiopian's Plan Now Calls For Narrowbody Order (page 2)". Archived from the original on 21 August 2012. Retrieved 21 August 2012. ↑ "Diamond Aircraft delivers DA40 NG aircraft to Ethiopian Airlines and recognizes increased demand for training aircraft worldwide" (Press release). Diamond Aircraft. 2010. Archived from the original on 2 May 2012. Retrieved 2 May 2012. ↑ "Ethiopian Receives Four New Pilot Training Aircrafts [sic]" (Press release). Ethiopian Airlines. 1 December 2010. Archived from the original on 9 June 2012. Retrieved 9 June 2012. ↑ "Ethiopian Airlines to Acquire Boeing 777-200s". Aviation Today. 27 December 2013. Archived from the original on 2 January 2014. ↑ "Profile for: Ethiopian Airlines". AeroTransport Data Bank. 26 April 2013. Archived from the original on 26 April 2013. "World Airline Survey – Ethiopian Airlines SC (page 569)". Flight International: 569 – 570. 13 April 1967. Archived from the original (PDF) on 2 May 2012. Retrieved 2 May 2012. "World Airline Survey – Ethiopian Airlines SC (page 570)". Flight International. 13 April 1967. Archived from the original (PDF) on 2 May 2012. Retrieved 2 May 2012. ↑ "Fleet". Ethiopian Airlines. Archived from the original on 19 March 2015. "World Airline Directory – Ethiopian Airlines (Page 77)". Flight International: 77 – 78. 29 March 1986. Archived from the original (PDF) on 2 May 2012. Retrieved 2 May 2012. "World Airline Directory – Ethiopian Airlines (Page 78)". Flight International. 29 March 1986. Archived from the original (PDF) on 2 May 2012. Retrieved 2 May 2012. ↑ "African Fokkers". Flightglobal.com. Flight International. 23 October 1996. Archived from the original on 26 April 2012. Retrieved 26 April 2012. Ethiopian Airlines received its first of five Fokker 50s on 2 October. The aircraft were ordered in 1995, to replace ATR 42s. ↑ "Cloud Nine". Ethiopian Airlines. Archived from the original on 25 June 2014. ↑ "Economy class". Ethiopian Airlines. Archived from the original on 30 October 2013. ↑ "Ethiopian Takes Delivery of the First Customized Q-400" (Press release). Ethiopian Airlines. Archived from the original on 2 October 2012. Retrieved 2 October 2012. ↑ "Food & Beverages". Ethiopian Airlines. Archived from the original on 30 October 2013. ↑ "Ethiopian – Cloud Nine". Ethiopian Airlines. Archived from the original on 2 May 2012. Retrieved 2 May 2012. 1 2 "Ethiopian – On Our 777-200LR". Ethiopian Airlines. Archived from the original on 2 May 2012. ↑ "Ethiopian – Economy Class". Ethiopian Airlines. Archived from the original on 2 May 2012. Retrieved 2 May 2012. ↑ "Ethiopian – Lounges". Ethiopian Airlines. Archived from the original on 2 May 2012. Retrieved 2 May 2012. ↑ "Accident record for Ethiopian Airlines". Aviation Safety Network. 28 September 2011. Archived from the original on 4 November 2012. Retrieved 29 September 2011. ↑ "Accident record for Ethiopian Air Lines". Aviation Safety Network. 28 November 2004. Archived from the original on 2 February 2014. Retrieved 29 September 2011. ↑ "Ethiopian Airlines jet crashes into sea off Beirut". BBC News. 25 January 2010. Archived from the original on 23 May 2012. Retrieved 10 January 2013. 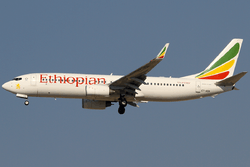 ↑ "Witnesses: Ethiopian plane tumbled out of sky off Lebanon". The Star Online. 26 January 2010. Archived from the original on 23 May 2012. Retrieved 10 January 2013. Guttery, Ben R. (1998). Encyclopedia of African Airlines. Jefferson, North Carolina 28640: Mc Farland & Company, Inc. ISBN 978-0-7864-0495-7. Wikimedia Commons has media related to Ethiopian Airlines. Hofmann, Kurt (18 November 2015). "CEO: Ethiopian Airlines plans to grow A350 fleet to 25 aircraft". Air Transport World. Archived from the original on 17 December 2015.